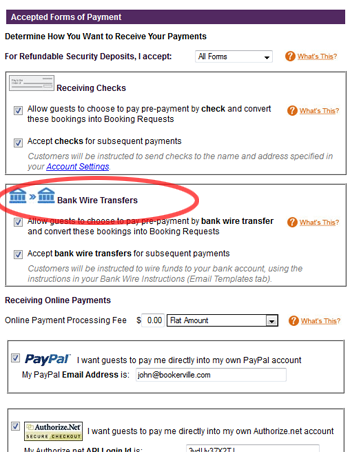 Bookerville now supports Bank Transfers as a method of payment for guests. This is very popular in Europe and other non-U.S. regions. Please note at this time, the bank transfers option is a manual process, and is also not integrated in an automated way with Bookerville. But you can enter your Bank Wire Transfer Instructions in the Email Templates tab of your property setup page. The Bank Wire Transfer Instructions can be different for each property, and these will be displayed to guests during the check-out process for both pre-payments (i.e. during the online booking process, or when they are confirming a quote sent by you), and also on the Make Payment page when they are directed there for subsequent payments. We are hopeful that a solution will emerge for automating these in a manner not too unlike Authorize.net and PayPal, so keep your fingers crossed. If you know of such a solution, please let us know about it. This is great but here in Canada we use something called e-transfers. Practically free to use. This is most common and does what the others described. The word Wire here or in the US means something entirely different. Wire Transfers costs the sender a bunch and then the one receiving it a bunch also. If you changed the name to Bank Transfers. (No Wire) That would work for indicating Account to Account Transfers. If there could be another one with e-transfers that would be amazing. Is there a way for a customer to confirm a booking online if paying via wire transfer? Copyright © 2019 Bookerville, LLC All Rights Reserved.